This review first appeared in Turbula in December 2009. Watching the 1975 World Series as a kid, with my beloved Cincinnati Reds facing off against the Boston Red Sox, I remember feeling put off by adults who would compare it to previous fall classics: 1960's Pirates-Yankees or '46's Cardinals-Red Sox. I mean, who could remember back that far? So here we are, 34 years later, and most of my co-workers weren't even born when the Reds and Red Sox went to seven games to decide a World Series featuring two teams both seeking their first title in decades. Don't remember the excitement surrounding Cincinnati's Big Red Machine, which dominated the National League West year after year yet had lost tough series in '70 and '72 against the Baltimore Orioles and Oakland A's, respectively. Don't remember Boston's glorious ace pitcher, Luis Tiant, the superb rookie seasons of outfielders Jim Rice and Fred Lynn. Have no idea how thrilling it was to simply watch Johnny Bench throw out baserunners. Remembering the middle-aged men who'd wax nostalgic about the classic series from their youth while I was trying to watch or listen to the Reds' post-season efforts in mine, I try not to yap on and on about the Big Red Machine during current playoff or World Series games. And after reading Mark Frost's wonderful new book, "Game Six," about the Series-tying 1975 game in which Red Sox catcher Carlton Fisk hit a game-ending extra-innings home run to send the series to a deciding game seven, I no longer feel the urge to inflict my memories of that series on the innocent. Frost frames the game half-inning by half-inning, building the tension toward Fisk's home run. Having interviewed most of the players and managers who took part, he's able to take us into the dugout, to listen in on the nervous chatter between the players. Fleshing out what would otherwise be a short narrative, Frost also takes breaks between half-innings to introduce the players' back stories: How Tiant and the Reds' Hall of Fame first baseman Tony Perez had escaped from Cuba, Davey Concepcion's struggle to earn respect in a star-studded Reds' locker room, Carl Yastrzemski's quiet approach to leadership, Red Sox pinch hitter Bernie Carbo's once-close relationship with Reds' skipper Sparky Anderson. Frost even interviewed the men (and woman) who covered the game on TV and for the newspapers, and places us in the pressbox at Fenway Park. From the perspective of a Reds' fan, there are a few kvetches: His coverage of the press is slanted toward the Boston media, with no comments from any of the Reds' Hall of Fame beat writers (Hal McCoy, who's still alive, is the most egregious, although both the late Si Burick and Ritter Collett published books about their experiences that include their thoughts on the Reds), and only a few comments from their Hall of Fame announcer, Marty Brennamen, who like McCoy is still alive and working. And what should have been an epilogue, wrapping up the careers and lives of the main characters in the story, instead turns into an extended exploration of the changes free agency wrought on the game in the years immediately following the '75 Series. It goes on too long, and distracts from the main narrative, which is, after all, about one of the most exciting games ever played in baseball history. Still, there's no reason you have to keep reading all that  and the part that is about that game, that series, those teams, is glorious indeed: well-written, truly insightful and informative. 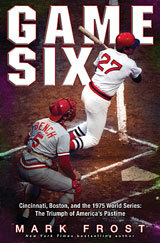 Fans of the Reds, Red Sox and baseball will all love this revisiting of one of the great World Series.